There are two types of wire brushes. 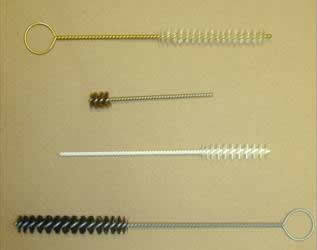 Hand held wire brushes can be used for light duty cleaning, abrading and some deburring processes. Power wire brushes are used for the same purposes but are intended to make the process easier, less time consuming and more efficient. There are many more machine operated wire brush configurations than there are hand brush configurations; hand brushes are only effective on a small scale and generally are not useful in heavy-duty surface treatment operations. Wire wheel brushes, cup brushes, end brushes and many other wire brush designs can be attached to motors that allow for brush rotation at variable speeds. Paint and rust removal, deburring, buffing and other similar surface treatment processes become possible on a large scale when undertaken with power brushes. Wire brush bristles can be crafted from a wide variety of metals. Brass, steel, stainless steel, bronze, aluminum, nickel silver, copper and titanium are all candidates for use as wire brush bristles. Each metal offers different qualities of abrasiveness, hardness, softness, durability, electrical and thermal conductivity and corrosion resistance, all of which must be taken into consideration in advance of a surface treatment process. 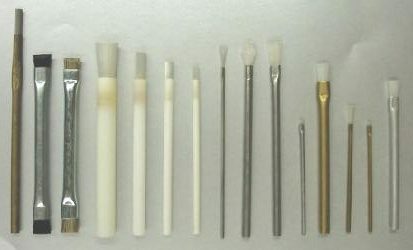 In the case of wheel brushes, cup brushes and end brushes, metal bristles are usually crimped in order to allow the wire to break cleanly as it wears, creating fresh new cutting edges. Some metals are more appropriate for this use than others. 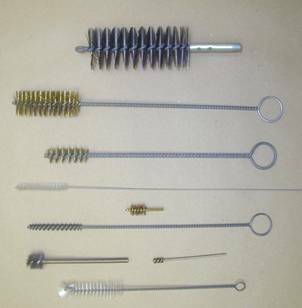 Industrial parts manufacturers use wire power brushes to deburr and surface-condition metal, plastic, glass and wood parts, while other manufacturers and fabricators use wire scratch brushes and scrubbers for die, mold or tube cleaning and many other applications that require vigorous scrubbing. Fine-bristled nickel silver and brass brushes are used for plating and polishing, and steel-bristled brooms are used for sweeping or scrubbing rough surfaces such as cement, stone, and street pavement as well as hard-to-reach ovens, brick and concrete.